These pillows are so easy, even I can do it - and I don't sew! They would make a great Christmas gift. These instructions are for a 12" x 12" pillow, but can easily be adjusted to any size pillow. Cut a piece of interfacing about 10" square. Place it on the cardboard, fusible side up. Cut 10" strips of ribbon and lay them vertically, securing at the top with a pin. Weave 10" strips of ribbon horizontally, over and under (just like those potholders we made as kids...) and secure with pins. Using a medium heat, iron the ribbon onto the interfacing - this usually requires holding the iron in place for about 10 seconds, follow the instructions for the interfacing. Cut two strips of material 3" x 10". 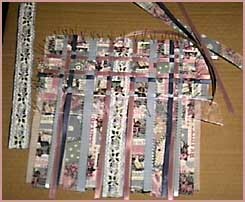 Place on opposite sides of your woven ribbon, sides together, and stitch about 1/2" seam. Cut off the excess and iron to flatten. Cut two strips of material 3" x 13". Place along the top and bottom, sides together. Stitch and iron as above. Hand stitch the cording around your ribbon square, or criss cross through the middle. Use your imagination, this is the fun part. Cut a 13" x 13" square of material. Place sides together and stitch a 1/2" seam along 3 sides. Turn side out. Fill with polyfill material or pre-made pillow. Turn edges under and sew closed. If you want, you can add extra trim to the outer edges of your pillow, such as cording that matches the ribbons, tassles, lace, etc. 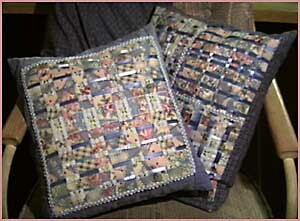 If you want to be able to remove the pillow from its covering, make the backing 13" by about 16" long. Sew three sides as above, and hem the fourth side. This will fold down over the pillow inside the pillow case. Then cut a strip of material the same width as the front. Hem 3 sides of this strip. Place side down on the front of the pillow case and stitch a tight seam around the sides and raw edge. This gets turned side out to become a flap, holding the pillow inside the case.